Actor James Tupper. Photo Credit: ©ABC/Danny Feld. For three seasons, Revenge fans thought David Clarke was dead. Dying in a knife fight in jail seemed a fittingly violent end for a man convicted of terrorism, murdering over 200 people on Flight 197. But there was one person stalwartly convinced of David Clarke’s (James Tupper) innocence: his daughter, Amanda (Emily VanCamp). Under disguise as socialite Emily Thorne, Amanda vowed to avenge her father and take down everyone who betrayed and framed him for their own crimes in favor of financial gain. The prime target list included Conrad and Victoria Grayson (Henry Czerny, Madeleine Stowe), the main witnesses who sent David to prison, and their son Daniel (Joshua Bowman), who Amanda married to put “sleeping with the enemy” in as literal terms as prime time television allowed. Not enough drama for you? The show is set in the lavish Hamptons with equally rich and influential residents, so throw in some high fashion, affairs, theme parties, pearls, poison, and you’ve got yourself a very fancy cocktail of destruction. Of course, given that revenge is the name of this game, it should come as no surprise that by the end of season three, Amanda had finally achieved success by socially, financially and/or emotionally ruining (most but not all of) her adversaries, and clearing her father’s name in the process. But there was a twist that blew everything out of the water: David was very much alive. The premise of the entire show was changed when his presence derailed from mere flashbacks in Amanda’s memory to the reality of a haggard man determined to reclaim his life. Turns out that David’s death was staged, there’s more than one henchman out to kill him, and a family clan of criminals really friendly with firearms tried to get Amanda out of the picture, too. Though things have recently settled down for the Clarke family as they work on “recovering Amanda’s childhood,” we can only assume that trouble is on the horizon. After all, when have things ever been quiet for long in the Hamptons? 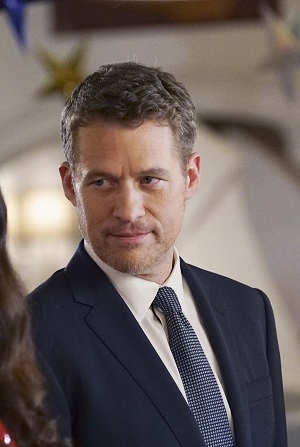 Naturally, being swept up in this amount of drama has actor James Tupper, who plays the resilient father, working more hours than the average 9 to 5 job. Despite his tight-packed schedule, we managed to catch him on the phone this past Friday to discuss Revenge family affairs just as he finished up filming and was in the midst of his morning Cheerios. GALO: Was David Clarke’s reincarnation always a plot line of Revenge or only once the first season gained widespread traction in prime time? James Tupper: I feel like the Revenge writers are really good at plot — terrific at it, actually. And as soon as expectations faded, they came back to the storyline of keeping people guessing. In a typical show, [the premise usually is that] a boy who is alone meets a girl, and then asks her out. Here a girl meets a boy, they get married, and they get revenge all in one episode! It’s a fun part of the show. But yes, David coming back was always talked about. GALO: After the shocking revelation that David was alive, viewers anxiously waited to see what the first interaction would be like between him and Amanda. Noting the high expectations the audience had, what was your main goal during this scene? Did you have any concerns? JT: The scene where Amanda first sees her father in jail, man, that’s one of my favorite scenes I’ve shot in my whole career. Not only was there a two way mirror (David couldn’t see Amanda but Amanda could see David), [but] there was this metaphor because we couldn’t see each other but still felt that connection to be reunited. I looked like Robinson Crusoe, like I had been through hell, and I thought that worked. It spoke for what we had lost and what we longed for. The rest of the season is working toward recovering Amanda’s stolen childhood. GALO: You’re playing a character that’s been framed, jailed, abducted and tortured (as well as forced to commit murder). What type of research did you have to do to act out these emotionally turbulent scenes? Many actors tend to draw inspiration from their own life experiences, but these are very specific and dire circumstances. JT: I think I wanted to work on the idea of if you were really isolated for a long time, what would happen to your world view? You would lose the ability to connect with people. I read a bunch of books about isolation, such as The House of the Dead [by Fyodor Dostoyevsky], where the main character is shackled and taken to prison. Research wise, I’m not the person that literally puts themselves in a trunk of a car and drives around all day, but I let my imagination wander. GALO: David constantly refers to how he “isn’t the same man” that he was before being wrongfully accused of terrorism, and we learn it’s because he was coerced to kill someone who tried to help him communicate with Amanda. In the future of the show, do you see him slowly returning back to the “old David,” or has the event forever changed his character? JT: His plan is to recover and reclaim his space, not by working in the financial world but by creating a relationship with his daughter. He can’t remake those childhood years, but he’s trying. It’s a cautionary tale: don’t get wrongly incarcerated for 20 years [laughter]. GALO: Going off that, do Emily and David stand a chance at having a normal relationship and family life? Or will someone new in the second half of the season threaten the fragile family structure they’ve tried so hard to parse together? JT: Yes, they’re going to try and rebuild. [Laughter] I’m so optimistic — I’m like David! GALO: After Kara (his ex-wife that tried to kill Amanda) and Victoria (who betrayed him and landed him in prison), he doesn’t seem to have much luck in his romantic life. Will David have more luck this season in the romance department? In other words, will he meet someone new now that Victoria is out of the picture? JT: There’s definitely a romantic interest coming up. Trying to excise some demons while having a relationship never goes well, though [chuckles]. JT: I play tennis! Just kidding [laughter]. I loved doing that scene. Ever since I was a boy, I was seeing great actors like Harrison Ford and Tom Cruise — leading men who don’t necessarily get Academy Awards. But what they do is always save their families and catch the villain. I was so excited that I did the scene in one extended take with four cameras. I guess it was just pouring out of my soul. GALO: The death of main character Daniel Grayson (played by Joshua Bowman) was a shocking plot twist that fans are still reeling over. I’ve read that the Revenge cast is pretty close, like family. How did everyone on set take the news when told this was next in the script? I think I was the last one to find out [about his death] and I was like, “What? !” I could not believe it. He brought so many great things to the show. JT: Daniel’s death wasn’t enough for you, huh? No spoilers on the premiere, just no! They’re watching me from a satellite right now — just waiting to see if I tell you anything I’m not supposed to [laughter]. GALO: Now that David has a renewed opportunity to act like a father to Amanda, he asks her to promise to avoid future revenge tactics. Do you see Amanda keeping this promise to him now that Margaux LeMarchal, the mother of Daniel’s child, is dedicated to her destruction? JT: They would have to change the name of the show, don’t you think? Picture it: Forgiveness, season five [laughter]. My wife and kids always say, “please do not bring David Clarke home!” On this show, everyone’s either lying or being lied to or playing an angle, but it’s so fun to do. GALO: You’ve covered many shows in drama besides Revenge (Men in Trees, Grey’s Anatomy), is this one of your favorite genres to act in? What have you honed from previous acting experiences that help in drawing out David’s complexity? JT: I feel like I really love acting, I’m challenged. I used to work as a carpenter and [did] every type of bartending. I just read a sitcom script. It just so happens that most of my opportunities are with very strong female leads in dramas (Christina Applegate, Anne Heche, Madeleine Stowe) — and it’s really fun to work with them. The really great part about playing David is doing flashbacks where he’s a financial analyst with his life in front of him, and then in the next hour I get to play a completely different character. I never get recognized! I have people talk to me and say that their favorite show is Revenge, and I say, “Thanks!” And they ask me, “Why are you saying thanks?” I look so different that they literally can’t tell I’m part of the show. I guess it’s kind of a weird compliment to get [laughter]. GALO: In your free time, what other TV series do you watch? JT: I’ve been watching Dig, my wife (Anne Heche) is on the show and she plays an FBI agent in Jerusalem. Better Call Saul is also good but to be honest, I really like football. I root for the Patriots. GALO: We have to ask then: thoughts on Deflate-gate? JT: It was total nonsense. But this is what happens when people are successful, other people feel like they have to dehumanize them a little bit — instead of just admitting that they were playing the game the best that it can be played. GALO: Besides Revenge, are you currently working on other projects that you’d like our viewers to know about? Or if not, then what is your ideal future acting project? JT: I want to be an action star! So I’m living that out right now with Revenge. I have a couple movies coming along but [they’re] still in the signing stages. For Revenge, we have a long season — we started shooting in July, and we’re going to finish in April. I actually just got back from the studio a few minutes ago! With 23 full episodes, it feels like a marathon. We’re curious to know what you thought about last night’s mid-season premiere. Sound off on our burning questions (and the interview) below: Do you think that Emily and Jack will eventually get together, or has that ship sailed? Will David and Natalie continue getting friendly, and what will Victoria’s reaction be to that news? And what do you think the story is with Ben’s ex-wife? Catch ABC’s “Revenge” Sundays at 10/9c. For up to date information about James Tupper and his roles, follow him on Twitter @MrJamesTupper. || Featured image: Actor James Tupper in ABC’s “Revenge.” Photo Credit:©ABC/Jordin Althaus.